Whenever Nate Espelin trots out to the field, he looks down at his glove for the signature saying, “big time players step up in big time games.” Espelin made sure that came true on Thursday afternoon. Trailing Austin Prep 5-0 entering the bottom of the seventh, Belmont rallied for five runs capped off by a Ryan Noone two-out RBI single. 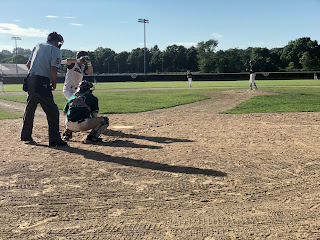 One inning later, Nate Espelin drove in the winning with an RBI single to right center field as Belmont defeated Austin Prep, 6-5, in eight innings on Thursday afternoon at Brendan Grant Memorial Field. The Marauders scored three of their five seventh inning runs with two outs. "I honestly think at the plate too much usually," said Espelin. "I was just trying to put the bat on the ball and not try to do too much there." Austin Prep ace Cam Seguin (6 IP, 3 H, 3 BB, 5 Ks, 80 pitcheS) cruised through the first six innings, allowing just three hits while striking out five, but with the Cougars on top 5-0 entering the final frame Seguin was lifted for Andrew Croteau. A one out walk was followed with an RBI double off the bat of Josh Lafauci that trimmed the deficit to 5-1. Justin Rocha followed with an RBI single to pull Belmont within 5-2. Two batters later, with two on and two out, Dennis Crowley roped a double into left center field that scored a pair and made it one-run game. With first base open, the Cougars elected to pitch to Marauders’ cleanup hitter to Ryan Noone. Noone made Austin Prep pay, dropping a 1-1 curveball into right centerfield that evened the game, 5-5. "Our kids have never quit all year," said Belmont coach Jim Brown. "I think Lexington was two runs but all our other losses are by one run. We are a late inning team. We have been all year." A strikeout ended the frame, but after Belmont reliever Martin Marintchev worked around a one out single in the top of the eighth, the Marauders made sure to finish their regular season on a high note. Martinchev reached on a two base error and a hit-by-pitch and walk loaded the bases with one out. The Marauders most valuable player in Espelin left his mark in the final regular season game of his career, lining a fastball into right centerfield to score Martinchev and give Belmont a walk-off, 6-5 win. “Nate (Espelin) and Noone are our top two hitters," said Brown. "Noone is hitting over .400, and those two work harder than anyone in the cages." Both Seguin and Belmont starter Justin Pollock flew through the first three innings, but in the top of the fourth the Cougars jumped in front. Logan Bravo tripled and Nick Cafarelli grounded an RBI single through the left side to put Austin Prep on top 1-0. Three batters later, with second and third and two men down, Croteau hit a chopper to short that was misplayed to bring home the second Austin Prep run. Seguin, meanwhile, kept Belmont’s offense at bay retiring eight straight hitters on just 22 pitches to finish his outing.. Leading 2-0 entering the seventh the Cougars gained some insurance. A walk and a pair of singles loaded the bases with nobody out. Cafarelli followed up by hitting a chopper to shortstop, but Steve Rizzuto’s throw home was late making it 3-0 Austin Prep. Logan Gillbride increased the AP lead to 4-0 with a single to left, and Alex Martinez hit a sacrifice fly to right to make it 5-0 Cougars heading into the home half of the seventh.